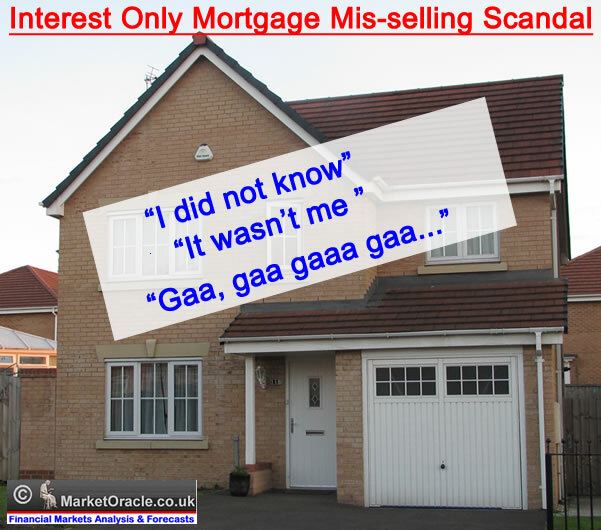 The Financial Conduct Authority (FCA) has started the mis-selling ball rolling with their analysis that more than 1 million interest only mortgage borrowers will not be able to repay the loans in full at the end of their mortgage terms. 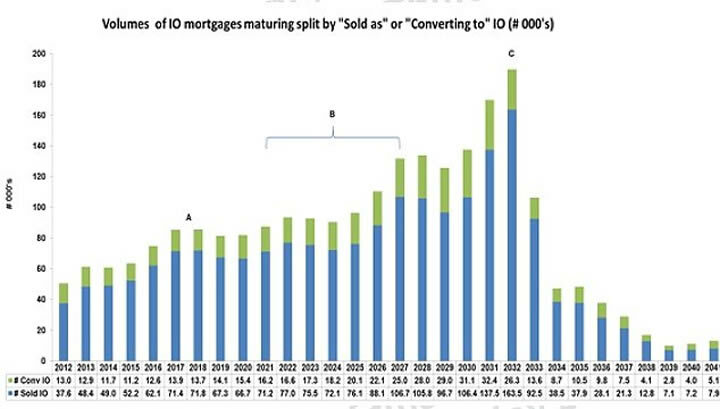 The above graph produced by the FCA shows that the next 20 years will see an increasing trend of maturing interest only mortgages where as many as 1.3 million of whom will not be able to repay the mortgages in full, and 10% having no plans at all for repaying the mortgages. Channel 4 TV News ran a good piece which highlighted the issue, representing the victim of the Banks latest mis-selling scandal which is one of enticing home buyers into taking out 3.6 million interest rate only mortgages, where an increasingly large number (15%) are claiming they did not understand when they took out the mortgages that they needed a plan to repay the capital. The consequences is that those unable to repay the mortgages at the end of the term will either be forced to sell their properties to repay the loans or extend the mortgage terms in perpetuity which means that home owners are in effect nothing more than glorified long-term renters. “We're worried that a significant proportion of consumers say they did not know they needed a separate repayment plan on their interest-only mortgage. We hope the FCA looks into this further to establish whether lenders made it completely clear to interest-only borrowers that they would need a repayment plan, to be sure that there wasn't widespread mis-selling." - Richard Lloyd, Which? The test for mis-selling will be that the borrowers were not aware of the fact that the mortgages were interest only and therefore a separate plan needed to be in place such as endowment policies to repay the capital at the end of the mortgage term. In which respect borrowers will need to deal with the fact that the mortgages were labeled as interest only mortgages on virtually every piece of documentation that was put before them at the time of taking out the loan. Therefore the only way that the 1-3.6 million of interest only mortgage holders can have any real chance of being successful in a mis-selling claim is if they were to argue the case of being mentally retarded at the time of arranging the mortgage as any other excuse will be deemed to be nothing more than opportunistic clap trap. The borrowers will need to prove beyond a shadow of a doubt that they are mentally retarded and thus were not able to perceive what the words 'Interest Only Mortgage' mean. I am sure many ambulance chasing firms will soon be springing to cold call everyone!
" Did You take out an interest only mortgage between 2004 and 2008? If so you may have been mis-sold and we can help you cancel your mortgage"
I am sure the mis-selling firms will be offering many strategies such as a DNA tests to detect chromosomal abnormalities etc..
Of course today's publicity should focus the attention of mortgage only interest borrowers who in many cases have more than a couple of decades still to go so should start saving now to cover the outstanding debt or better still to start to make capital repayments on the mortgages as many interest only mortgages actually do allow a certain amount of capital to be repaid each year without penalty. The bottom line is that interest only mortgages means that you are only RENTING the property at a discount to the market rents with the added bonus that you can expect to get some RENT back on the difference between the mortgage and house value. The last labour government bribed 240,000 vested interest voters by PAYING their mortgages. The public spin on SMI was that it supports those who become unemployed, paying the interest on mortgages for upto 2 years of upto £200,000 at a flat rate of 6.08% which translated into a maximum benefit of £12,160 per year on top of ALL other benefits. This despite the fact that the policy of zero interest rates had long since pushed mortgage interest rates to about HALF the amount of benefit being paid out! So the tax payer had been effectively paying Interest AND Capital as in a typical 3% mortgage rate the benefit covers the interest on a mortgage upto £400,000! There is a real fraud taking place right now in the UK and it is NOT on mortgage borrowers but as a consequence of the inflation inducing money printing debt monetization programme to force down borrowing costs primarily for the government and ALL existing mortgage holders who have seen their mortgage rates slashed by over 50%. The price paid for this fraud is by ALL Savers where the likes of schemes such as QE4Ever, QQE and Funding for lending have resulted in over FOUR YEARS ! of sub inflation after tax interest payments, with only very brief moments when savers could have locked in rates above the rate of official inflation (RPI), i.e. today the best rates on offer for instant access accounts are all SUB 2%, and even fixed rates are sub 3% with official inflation rate RPI of 3.3%. This is THE fraud as Savers forced to pay for all reckless borrowers. In conclusion, I agree that interest only mortgage borrowers who are medically proven to have been retarded at the time of taking out interest only mortgages should be compensated to some degree for not understanding what they were being signed upto, but as regards with the vast majority of potential claimants, they amount to nothing more than opportunists trying to fund another way to cash in on the britians out of control claims culture, where the real victims are the savers who SHOULD be compensated for the difference between artificially low interest rates and at least CPI inflation if not RPI (after tax). SOS - Save Our Savers! Trust you'll excuse this off topic subject and question, but could you please offer some commentary on the markets of late? Nadeem, have you noticed that some lenders (EG: The Post Office) are now offering mortgages with a low teaser rate for, say, five years - and then a variable rate for the rest of the loan at the BOE Base Rate + 3.99%!!! In normal times, the variable rate would be 1% to 1.5% above base. If interest rates rise, some borrowers will be paying a shocking rate of interest with big penalties to exit the mortgage. I have been writing for several years that the base rate is irrelevant, that it does not reflect market interest rates, so if the base rate rose that would not automatically translate into a like for like mortgage rate rise, especially as in your example the market rates have a lot of slack built into them. The real driver for market intrest rates is the real inflation rate, which is about 4% in the UK. Do you agree with Mervyn's last statment re the UK finally seeing the light? We're thinking of returning to the UK from Aus with an investment in London housing. I thought for a while that AUD would be fairly safe because the UK situation seemed more grim than ours with all of the stimulus in the UK outweighing the rate cuts in Aus. Interested to find out what your current forecasts are for British Housing and GBP and more printing (and impacts of election spending). I'm trying to determine whether a change in trend is emerging where the UK may start to see some good news.